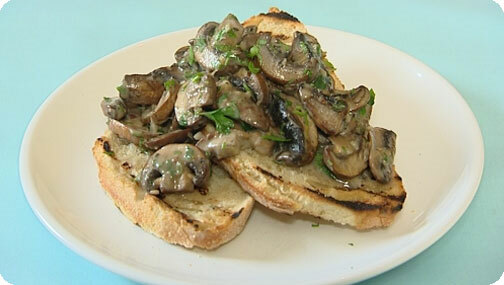 Mushrooms on Toast - 157kcals and 7.3g fat per serving. Heat a griddle pan then grill the bread for 1-2 mins on both sides or until toasted and charred. Heat a small frying pan until really hot then add the oil and mushrooms stir-fry on a high heat for 3-4 minutes or until browned. If the mushrooms release water then the pan is not hot enough! For the last minute of cooking add in the garlic. Stir through the crème fraiche, parsley and lemon zest, season with salt and pepper then serve the mushrooms poured over the toast.